Labeling of clothing - To assist us in keeping track of your clothing, please allow us to label all items of clothing at the time of admission. Clothing needs to remain in the suitcase where it will be taken to the laundry for labeling and then returned to the resident. Whenever you receive new clothing, please give the items to the Charge Nurse or PSW staff immediately for labeling. Ensure the name is pinned to the clothing and placed in a bag also labeled with the name and a note that it needs to be labeled. The hair salon is located on the Main floor on Mondays. Appointments can be made through the Charge Nurse at the nursing station, visiting the Salon on Mondays; leaving a request in the Hairdresser mailbox (on door of salon) Fees are posted on the door of the Salon. Barbering services are also available by the Hair Salon. There are a variety of activities available at the home. Family and friends of residents are invited to participate. Our Activation department strives to provide quality programs to meet to social, emotional, physical, intellectual and spiritual needs of all residents. 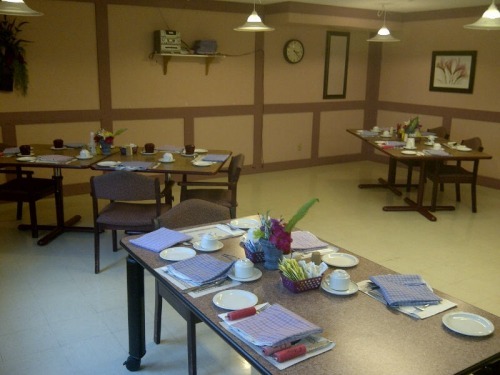 Blackadar Continuing Care Centre strives to meet the spiritual needs of all residents. Services are held on the Resident Home Area. Please check our monthly calendars to find out when services of which faith/denominations are being held. The Residents Council is an important part of life of Blackadar Continuing Care Centre . The council meets on a monthly basis. The Residents Council is established to provide an avenue for residents to express ideas and concerns to staff, with the goal of improving services to residents of Blackadar Continuing Care Centre . 2. The council receives comments from residents to help determine the wishes, needs and abilities of any resident with respect to the total program at Blackadar Continuing Care Centre. 4. The council respects the confidentiality of information concerning any individual resident, and will never permit any discussion of a residents social or medical information. The council will consider and discuss a resident’s suggestion or valid criticism if they apply to all residents. It is not complaint bureau. The Residents Council welcomes you to Blackadar Continuing Care Centre . If you are interested in attending a residents council meeting, please contact the Resident Program Manager, for an invitation. We are always looking for interested family members to serve on our Famliy Council. Family Council is made up family members and staff. The purpose of family council is to improve the quality of life for residents and to give families a voice in decisions affecting residents. Dates are posted on the Family Information Board on the First floor by the Nursing Station. The home’s volunteer services program is currently in the process of recruiting. If your family member requires or wishes to have special visits please contact the Resident Program Manager or anyone in the Activation Department. Blackadar Continuing Care Centre encourages and is partnered with accredited schools and colleges for students to complete educational placements. If you have time and talents to spare, we need you! Please contact the Resident Program Manager if you are able to volunteer any of your time or talent. 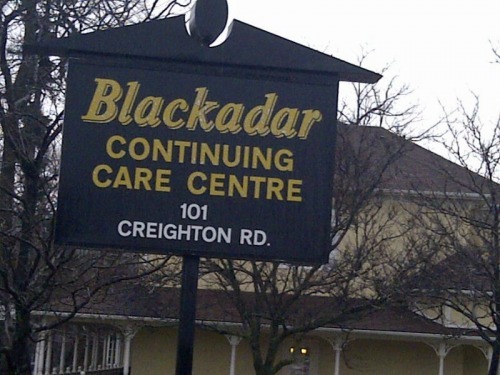 Blackadar Continuing Care Centre is a great place to volunteer. Activity Calendars are posted monthly at the main activity room and on all nursing units. Additional copies are available for residents and families to take home or to their rooms for easy reference. Programs and activities are scheduled during the day, evening, and on weekends. Residents are encouraged to participate. Generally, there is a monthly outing and residents are encouraged to attend the outings, however space is somewhat limited on some outings and residents will be offered a place on outing on a rotational basis so all may enjoy an outing. Families and friends are welcome to accompany a resident on an outing, however, if space is limited on the home arranged transportation, a family member may have to use their own mode of transportation to get to the outing. Residents must first sign out at the Nursing Station. This is to ensure that the resident is able to manage independently and indicate expected time of return. Residents who cannot manage independently, are not allowed outside the home unaccompanied. A responsible person must be present to sign out the resident at the nursing station. Please contact the Nursing Station to confirm your requirements for signing out. All mail is sorted at the front desk; the mail is then delivered to the respective room by the nursing staff. Newspapers are delivered to the front desk, and then delivered to their respective room. For outgoing mail, please bring mail (with appropriate postage) to the business office on the first floor. Canada Post picks up mail by 10:00am Monday to Friday. We recommend that you arrange for your own telephone line. If you do not have a telephone in your room, we can only take messages and forward them to you, as we are able. All visitors must sign-in on the table in the lobby. Upon leaving the home you must sign-out. This is to ensure the safety of the residents and to know how many people are in the building in case of emergency. Though there are no specified visiting hours, we ask that visitors be respectful of residents and their roommates need for privacy and rest and to visit accordingly. The front door is locked at 11:00pm; however, there is a night bell outside the front door for residents and families to use after this time. Check with the nursing station prior to giving food to your relative, as there may be dietary restrictions. We ask that you do not share food with other residents. Check resident’s room for spoiled foods and remove spoiled foods immediately. Keep residents food in tightly closed containers labeled with their name and date it was received. Please ensure that any food in the resident’s room is kept in a closed container. Food left out encourages pests and is an infection control risk. The Housekeepers are directed to remove any spoiled foods from the room immediately. Blackadar Continuing Care Centre is a non-smoking home. Residents who can smoke independently and safely are allowed to smoke outside the building at the designated smoking area. Cigarettes and lighters are not permitted in the resident areas and must be turned in to nursing staff at the nursing stations. The smoking policy is strictly enforced to ensure the safety of all residents and staff of the home. Alcohol and cigarettes must be left at the nursing station. For some residents, combining alcohol with medications could be a deadly mix. All residents must have a doctor’s order for alcohol. Please speak with the charge nurse. All electrical items brought to Blackadar Continuing Care Centre must first be checked by the Maintenance Department, prior to being used. If a new electrical appliance is purchased, please notify the charge nurse of Environmental Manager who will make a referral to the Maintenance Department. Electrical items that are not allowed in the home: kettle, heating pads (risk of severe burn), electrical blanket, extension cords and humidifiers. Fire drills are held 3 times each month and are unannounced. This allows our staff team to be ready for any real emergency. Drills are vital to ensure your safety and to make sure you know what to do and where to go in the even of a real fire. By law, the home must have monthly drills. Your co-operation in all fire drills is mandatory. Please do not be offended if we don’t answer the phone or are abrupt during an alarm. We must keep the lines free for communication with emergency support personal.